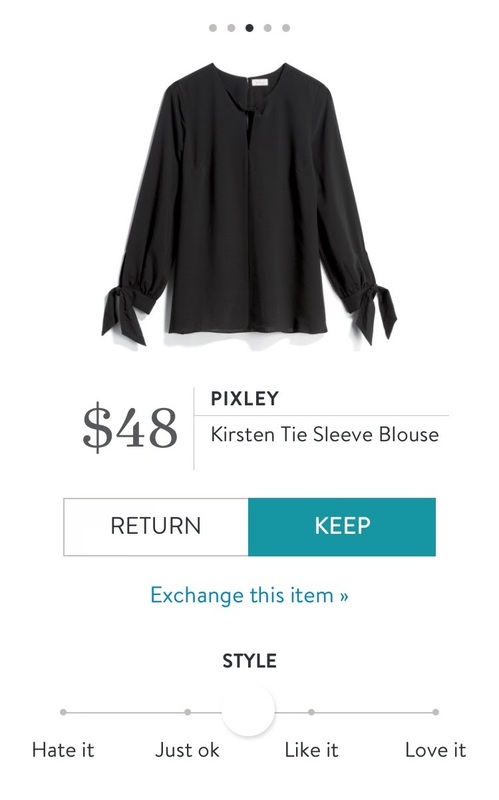 Even though this is technically the second stitch fix I’ve received, it’s the first one I’m creating a post for. I forgot to take pictures from the first one, and once you send the fixes back, you can’t see the photos anymore! I also didn’t take any pictures of the first fix…whoops. But I also didn’t keep anything from that fix, so you’re not really missing anything. 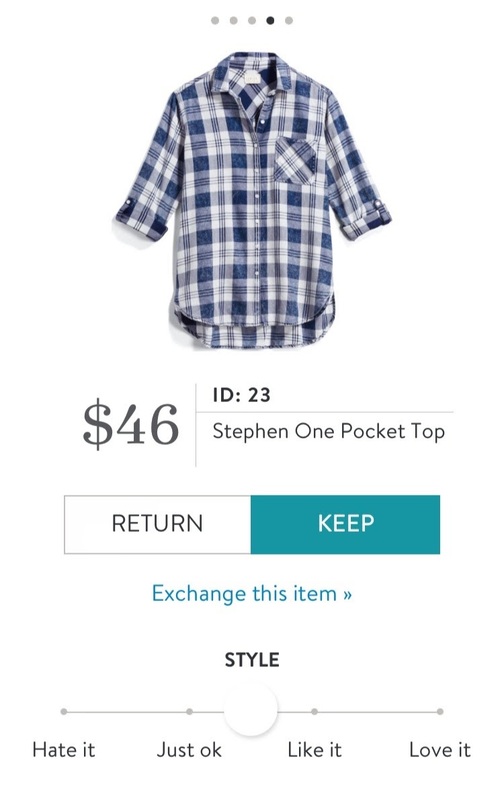 If you’re not familiar with how Stitch Fix works, here is a brief break down for you. If you know the drill, skip down to the good stuff! I had the same stylist, Mia, for this fix. At the end of your check out, you can ask to receive the same stylist, ask for another, or leave it up to them. I left it up to them after the first one, and got Mia again. This fix was better than the first, as I could tell she really tried to give me what I asked for. I asked for white jeans, a plaid shirt that was mostly white, and something for work. Each fix comes with a personalized note from your stylist telling you why they picked each piece for you and a few ideas for how to style them. I found this helpful when deciding how to pair the clothes with what I already have in my closet. I would have totally kept these jeans if they fit better in the waist, and weren’t ankle length. 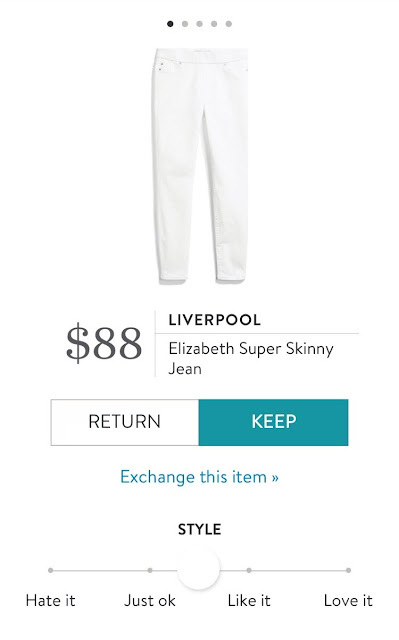 I received these exact jeans in black in my first fix, and I wanted to keep them, but I really didn’t like that they slip on and don’t have a button closure. I am all for making an investment in denim, since I wear it a lot on the weekends, but I was worried that over time the waist would stretch out and they wouldn’t stay up as well. With no belt loops to secure a belt when that happened, I had to say no. The black pair fit like a glove, whereas this white pair you can see the waist was too big. They were the exact same size, but it just goes to show that everything is made differently! I’m not a fan of ankle length jeans personally just because I am on the taller side (5’8’’) and like my jeans to all be long enough to touch the bottom of my heel. I’m going to request these again, just with a button closure and regular length. Otherwise they would have been a win! I didn’t even have to take these out of the bag to know I wasn’t going to keep them. I asked for black flats for work as my current Steve Madden flats that I love are on their last leg. But I was hoping for actual flats, not loafers. 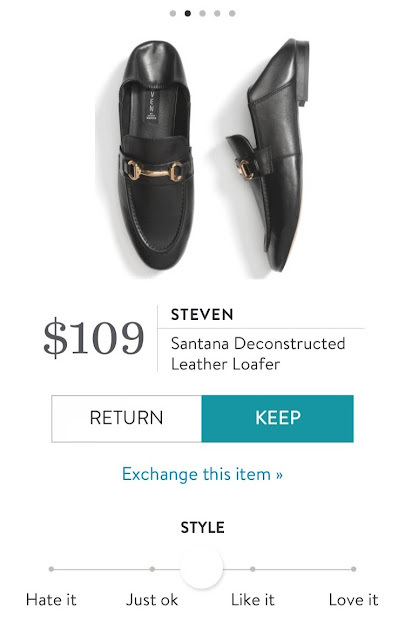 I am not a fan of loafers at all. They’re just not my style. I’ve seen them on girls that can definitely pull them off, but I am not one of them. I took one out to see if they even fit, but immediately put it back. No indeed. This top was a pleasant surprise. I love neutrals and specified that in my style profile. Bright colors don’t look good on me because I’m so pale, and I also like to be able to mix and match everything I have which is hard with bright colors as I’m one of those people who liked to mash instead of intentionally clash colors together. For my personal style, simple is better. Which is why I loved this shirt. It is simple and black, but has some really cute details. The keyhole neck is twisted at the top. The knotted sleeves add a cute little flare to an otherwise would-be plain shirt. This was a definite keeper as it’s perfect for work. The sleeves were a little on the short side, but they hit right at my wrist and I typically push my sleeves up anyway. I tried them rolled once and that was perfect. I did ask for a button up plaid shirt that was mostly white, so in theory, this shirt should have been a win. But it was just a little too big for me, I felt like I was swimming in it. And I wasn’t overly in love with the blue. I’d prefer if it was black or grey with the white, and farther apart pattern wise. It was very soft, and I liked the pocket. Mia did listen to what I wanted, it just wasn’t a perfect match this round. With the fall weather coming, I’m definitely always looking for new cute jackets to wear. 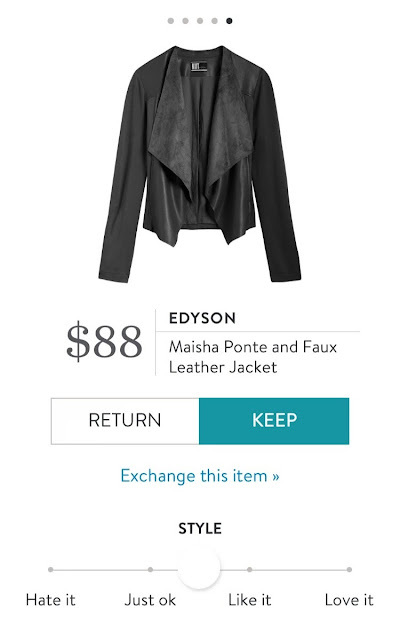 This jacket is a push out of my comfort zone style wise, as it has both suede and faux leather. It fit quite well all over, but upon looking closely at it, I didn’t like the way the faux leather looked with the suede. To me it appeared a little cheap in terms of the edges and the stitching, and $88 isn’t exactly cheap for a jacket. I adjusted the lighting in the photos to show the contrast in the detail a little better. This jacket was just not for me. I do have a faux leather moto jacket that I need to get a replacement for, but this was not the winner. Hopefully one of the next few fixes will have another cute jacket to try. Overall, this stitch was an improvement from the first one. I did expect there to be a learning curve as you can’t expect someone to know your exact style right off the bat. Upon checkout, I did request a different stylist. I’ve mad Mia the past 2 times, and while this fix was better than the last, I feel like trying someone else will offer a different perspective on my style. I try to go through my Pinterest fashion board and keep it as up-to-date as possible with what I’m hoping for from my fixes. I also note in my style profile what I do NOT wish to receive like velvet or embroidery or raw hem jeans which all seem to be ‘in’ this season. I much prefer my style to be classic and timeless, as trendy pieces are usually only good for one season before you won’t want to wear them again because they aren’t on trend anymore. As you might know, I recently went through a big closet cleanse and got rid of approximately 70% of what I had in there. I go through my closet fairly often and get rid of things I don’t really wear anymore for whatever reason. I either sell my items on eBay for a steep discount, or what I feel like I can’t sell I donate to Goodwill. I like to keep my closet down to things that I really LOVE. The kind of things I would buy and then if I went out shopping and saw it, I’d buy it again. Learning to decipher between like and love have helped a lot, and Stitch Fix helps add an edge into it as I’m not really shopping for myself. Would you have kept anything different than me? Let me know below! If you’re interested in trying it out, please use my referral linkand let me know about your experience! !